While visiting my former homeland of British Columbia this fall, I got a bit nostalgic for one of my old favourite places to explore: the big ferries that shuttle cars and people back and forth between Vancouver and Vancouver Island. My family had always been fond of taking day trips to Victoria, and I'd quickly learned that exploring the ship during the two-hour trips between the mainland and the island was both cheaper and more thrilling than pumping steady streams of quarters into Tutankamen and Bagman in the onboard arcade. 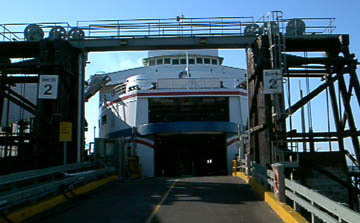 Exploring the engineering levels of the ferries quickly became my favourite aspect of the trips to the island. It was impossible to resist this invitation. 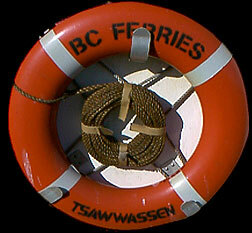 So, during my visit I took the bus out to Tsawwassen ferry terminal and purchased a one-way ticket across. I figured I’d hide somewhere and stow away on the way back to save some money. While waiting for the ferry, I wandered down to the docks to take some pictures. As I wandered, I couldn't help but notice that the car ramp leading to the ferry in dock two, the Queen of Esquimalt, was in place. I was pretty sure I'd soon be shooed away from the area, but I figured it couldn't do any harm to wander up the car ramp and perhaps take a picture or two before someone started yelling at me. 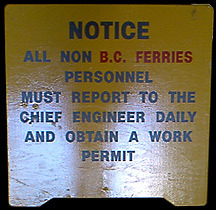 As I jumped down from the car ramp to the inside of the 9,300-tonne bundle of fun, I spotted a sign informing me that all non-BC-Ferries personnel had to report to the chief engineer. That sounded reasonable, but first I walked to the bow of the ferry and stepped outside to take pictures of the other ships in port. Stepping back inside the ferry, I decided to get down to business. If I were a chief engineer, I asked myself, where would I be? Somewhere cool, probably. 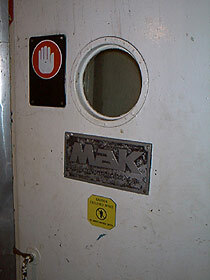 The nearest cool-looking thing was a small metal door leading into a pillar in the centre of the ferry, behind a “Caution Enclosed Space” sign. I figured the best place to find the chief engineer was somewhere cool. I found myself in a hot, dimly-lit world of huge metallic pipes and extremely steep metal mesh staircases leading both up and down. The lower levels seemed much noisier, so I elected to make my way to the top first. 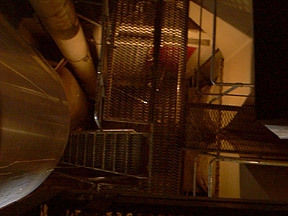 I climbed up about five storeys before the stairs ended; I then hopped over some large pipes in order to continue the ascent via ladders. At the very top of the engineering shaft, I came to a metal portal set into the ceiling — as I spun the wheel to open it, I pictured myself emerging triumphantly from the smokestack at the very top of the ferry. Unfortunately, the portal was either locked or firmly wedged shut. 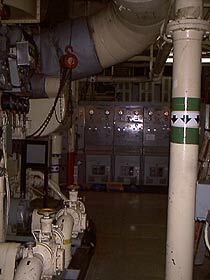 engine rooms in the basement to the top of the ship. Climbing back down two levels, I went back to investigate a door I’d passed on the way up. The area on the other side was cool and pitch black. I’d forgotten a flashlight, so I waited until my eyes adjusted enough for me to see that I was in a narrow hallway with metal walls. I moved down the hallway slowly while groping the walls on either side for doors. The first door I came across was locked, but the next opened to reveal a painfully well-lit staff kitchen and breakroom. 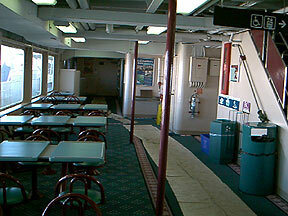 The passenger area of the ferry. I next came to a heavy metal door that I propped open before proceeding into the sun-flooded hallway beyond. Descending a set of wide, carpeted stairs, I emerged into the public area of the ferry. Most of the floorspace was covered in large sheets of brown paper, as if to prepare the inside of the ship for a new paint job or some other major renovation. I returned to the engineering shaft and made my way down to the lower levels of the ship. I descended the metal mesh staircases as quietly as possible, but found that I truly had the whole ferry to myself. I explored the engineering levels thoroughly, taking pictures of all the mammoth machinery and the creepy automatic watertight doors that threatened to seal me in after a mere 10-second warning. Nice. As icing on the cake, after I emerged from the ferry, I returned to the terminal and got a full refund on my ticket! This article originally appeared in Infiltration 15, together with other boaty articles.